Free Sunday parking has reduced turnover of spaces, and business owners said they want it eliminated. DOWNTOWN — With holiday shopping well underway, aldermen representing some of the busiest retail strips in the city still are waiting for Mayor Rahm Emanuel to keep the promise he made to allow certain wards to retain paid metered parking on Sundays. Six months after the City Council passed a renegotiated parking meter lease, business leaders and aldermen in some wards say free Sunday parking has led to low meter turnover — which means fewer customers are able to park and shop in the neighborhoods. Kevin Vaughn, owner of a handful of restaurants and bars, including Lakeview's Mystic Celt and Vaughn's Pub, said he was trying to find parking outside one of his businesses early Sunday morning and most of the metered spots were filled — a problem that began after free Sunday parking began. "Eighty percent of the spots were filled at 8 a.m.," Vaughn said. 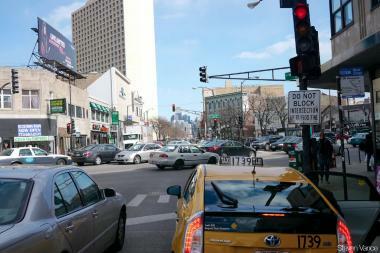 "In Lakeview, Sunday is the second busiest commercial business day of the week. Ultimately [free metered parking] is bad for business." The revised agreement with Chicago Parking Meters LLC made changes that the Emanuel administration said give the city more control over the meter system than the original agreement, and free Sunday parking was one major change Emanuel wanted to see in the new deal. But that didn't sit well with a handful of Council members. Some aldermen were hearing opposition from chambers of commerce and businesses in busy retail areas that depend on the turnover of metered spots to allow as many customers as possible to shop. During hearings leading up to the new lease, the city's top lawyer assured aldermen that if they wanted paid Sunday parking to stay in their wards, that would happen. "We have not heard anything," said Libby Prakel, chief of staff for Ald. Michele Smith (43rd). "Of course we've been talking to the mayor's office and asking what's happening. We're frustrated as well." Back in June, the 32nd, 43rd and 44th Wards — which include Lincoln Park and Lakeview — filed requests to bring back paid Sunday parking. Smith, Ald. Scott Waguespack (32nd) and Ald. Tom Tunney (44th) all voted against approving the renegotiated parking meter lease. Waguespack said city attorney Stephen Patton has assured him that the city would draft an ordinance to bring back paid Sundays meters to his ward, but he's still skeptical. Waguespack added that changing the Sunday parking deal in some wards would open the revised deal to unwelcome scrutiny and perhaps unearth unforeseen weaknesses in the renegotiated lease. The city did not return multiple requests for comment on the issue. Meanwhile, business owners and chamber leaders are growing impatient. Vaughn said the promise of free parking on Sundays is creating more traffic congestion in an already congested area, and he predicts it will get worse when the Cubs season begins in the spring. "I believe it drives congestion on Sundays," the Lakeview bar owner said. "People want to park for free, so they will circle the block for 20 minutes to find that free spot. Residents in Lakeview rent parking spaces during Cubs games for 20 bucks. Why would you pay 20 bucks if you can park for free? All we're doing is creating congestion on the second-busiest commercial day of the week. It's a quality-of-life issue." Heather Way, executive director of the Lakeview Chamber of Commerce, said her organization has not heard anything about switching back to paid Sunday parking and feels the situation is discouraging shoppers from coming to Lakeview. "Regulated parking is appropriate in commercial districts," Way said. "Metered parking is necessary for turnover of parking spaces. Lakeview doesn't have the best reputation for available parking already, so if people don't think they can find parking on a Sunday they may go elsewhere." Lincoln Park Chamber of Commerce spokesman Padraic Swanton has a similar view and is puzzled by the delay in bringing back paid Sunday meters. "I didn't expect it to happen overnight, but it shouldn't take this long," Swanton said. "We're in favor of reintroducing paid meters, otherwise the ability for businesses to turn over customers is eliminated." While Vaughn said he is skeptical that the city will keep its promise to restore the paid parking, Way is trying to remain hopeful. "If they're really interested in maintaining their word to bring regulated parking back to Lakeview, we're ready to take it back," Way said. "Whenever they're ready, we're ready."